Imagine a world without pizza, nachos, cheeseburgers, mozzarella sticks, macaroni and cheese; a world without cheese. The significance cheese goes well beyond its delicious taste. Living in a world with thousands of cheeses from many countries and cultures, it is difficult to imagine there was a time in human history when cheese did not exist. Some of us cheese lovers might even feel a little faint thinking about the so-called cheese-less time. Thankfully, new research suggests the dark time before cheese may be shorter than originally thought. 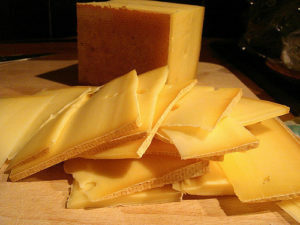 Remnants of cheese fats were found in pottery in Croatia that date back to between 6000 and 5000 B.C. Previous studies suggested cheese did not arrive in the Mediterranean until 3000-1200 B.C. ; about 3000 years later! The development of cheese making in these ancient villages may have decreased mortality rates in children and aided in the evolution of dairy tolerance, so we can eat our favorite cheeses today. You might be wondering, how do you identify cheese remnants that are over 7000 years old? The secret lies in fat. Most foods (whether from plants or animals) contain fat, and anyone who has tried to lose weight can tell you fats are difficult to make disappear, allowing them to withstand the test of time. Fats are made up of chains of carbon, an element that is found in all life on Earth. There are three types of carbon that occur in nature, collectively called carbon isotypes. In fats, carbons are attached in chains that can vary in their length. By looking at variations in chain length and the carbon isotype found in the fat, scientists can determine where the fat came from; meat, vegetables/plants, or dairy. Furthermore, scientists can even determine if the fats are from fermented dairy products, such as cheese. Using this technology, the scientists identified fats in ancient pottery discovered in Croatia that are likely from cheese. A similar technology that looks at what makes up proteins, instead of fat, was used to identify the oldest solid cheese, which was found in an Egyptian tomb earlier this year. The ability of an individual to eat cheese and increase their chance of survival to adulthood could lead to a population with more people who are able to eat cheese over multiple generations. This diagram assumes everyone who lives to adulthood has three children with the same “cheese-eating status” as their parent. While many of us might think the significance of cheese lies in the ability to enhance our food with its melty, cheesy goodness, the impact of cheese-making on ancient peoples was likely more significant. Cheese would have provided vital protein, calories, and fat for people in ancient villages, especially during winter or times of famine and disease. Scientists also think the high protein and calorie content in cheese would have been a great source of nutrition for children and likely aided in their survival to adulthood. Furthermore, the advent of cheese-making in these ancient villages probably aided in the evolution of humanity’s ability to eat dairy. People living in ancient times were lactose intolerant. Because cheese contains less lactose than milk or other dairy products, it is likely people in 5000 B.C. could tolerate small amounts of cheese. 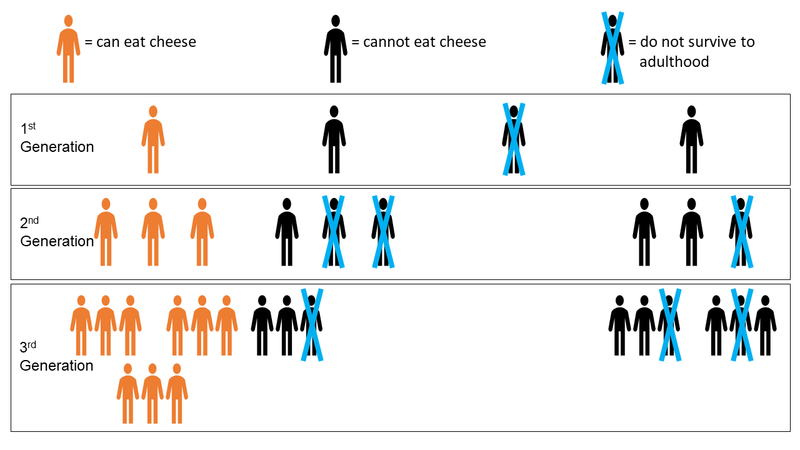 However, if children who could eat more cheese were more likely to survive to adulthood and then have children who could also consume larger amounts of cheese, over time the people in these villages would become able to eat more and more cheese (see diagram above). Over the course of thousands of years, the human population would evolve to be able to eat food with more lactose, such as milk or ice cream. A world without cheese would surely be a less tasty one, but the more we learn about the origins of cheese, the more it seems that a world without cheese would not be the world we know today. Peer edited by Rita Meganck.